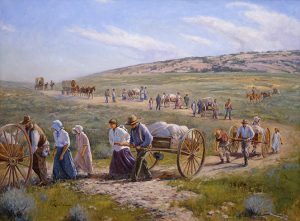 As Latter-day Saints, the word “pioneer” tends to conjure mental images of handcart companies trudging toward the Utah desert and all the suffering that accompanied such journeys. Perhaps some people also think about modern-day pioneers—Saints who are the first or only members in their families. Still, what exactly is the definition of a pioneer? Can any Latter-Day Saint become one? Fear not, friends! This question need not keep you up at night any longer. In the fourth chapter of Teachings of Presidents of the Church: Gordon B. Hinckley, we can read about the reflections of our beloved former prophet on this very subject. He believed that “each of us is a pioneer in his own life, often in his own family.” Basically, honoring and becoming pioneers requires that we actively nurture the following five essential characteristics within ourselves. Working Together, by Olinda H. Reynolds. Courtesy of the LDS Media Library. This is the solution to almost every problem that arises in our path from mortality to exaltation, so we’re used to hearing it. However, President Hinckley offered some revealing insights into what it means by recounting the experiences of the pioneers. Quoting Paul explaining that “faith is the substance of things hoped for, the evidence of things not seen” (Hebrews 11:1), President Hinckley extolled the pioneers’ ability to bring their faith to reality through hard work and confidence in God. Faith is more than simply acknowledging that the Lord is able to do what He says He can do. Living with eyes of faith means being able to perceive the “evidence of things not seen”—a thriving city in a swamp, new beginnings in death, springtime in a horrible winter, and Zion in a desert. 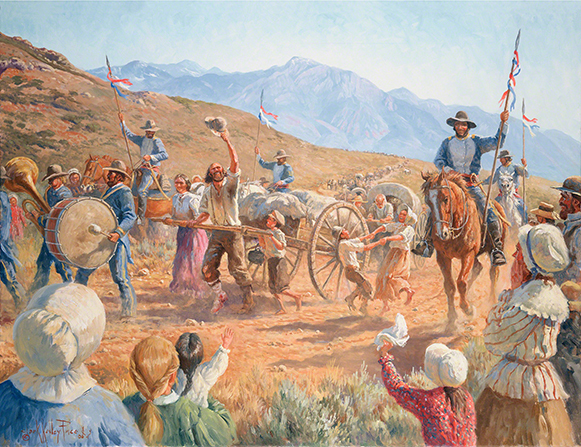 Pioneers have faith to see what can and should be, guided in their optimism by their conviction that if the Lord could create wine out of water, prophets out of common folk, and saints out of sinners, then He can surely make a beacon out of a barren valley and a rolling church out of a few struggling handcart pullers. The Lord Himself embodied this kind of faith. 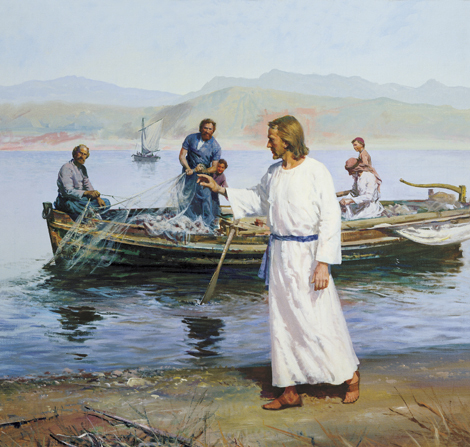 For example, He was able to see world-changing apostles in lowly men, including humble fishermen. His Atonement attests to the enormous potential He saw in each person for whose sins and afflictions He suffered. Calling of the Fishermen (Christ Calling Peter and Andrew), by Harry Anderson. Courtesy of the LDS Media Library. Faith means to see what cannot be seen—and then to act upon it. Pioneers have this kind of faith. The hardships endured by the pioneers are nearly unimaginable to us. Many of us live in a time and place in which modern conveniences are commonplace, and we rarely feel the stings of plague, starvation, and fatal exhaustion. Consider everything that you own and enjoy—your job, house, furniture, electricity, plumbing, entertainment center, social prestige, etc. Imagine leaving every single shred of it behind. What would compel you to do that? What could possibly be worth giving all of that up? If you would do it for a place where people are “pure in heart” (Doctrine and Covenants 97:21) and “of one heart and mind and [dwell] in righteousness” with “no poor among them” (Moses 7:18), then you may be a pioneer. If Zion—the City of Holiness, in which all things are consecrated for the kingdom of God—is your ultimate goal, then you may be a pioneer. 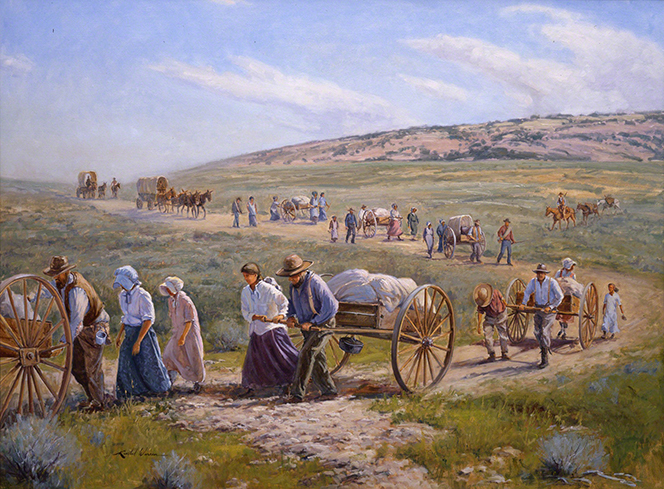 Pushing, Pulling and Praying, Bound for Zion, by E. Kimball Warren. Courtesy of the LDS Media Library. Zion represents the pinnacle and the ideal of Latter-Day Saint life. Pioneers dream of and prioritize Zion. Closely related to the concept of Zion is the principle of sacrifice, especially with regard to your materials, time, and even life, so that you can benefit other people. President Hinckley used the example of the plight of the Willie and Martin handcart companies to illustrate this point. 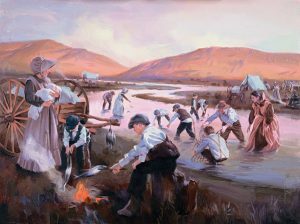 Helping the Martin Handcart Company across the Sweetwater River, by Clark Kelley Price. Courtesy of the LDS Media Library. 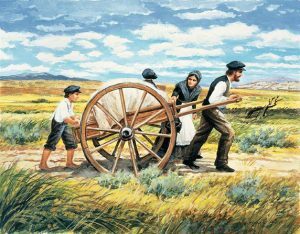 Like the pioneers who risked their own safety to help their struggling brothers and sisters in the Willie and Martin handcart companies, we are called to make sacrifices to reach out and improve the circumstances of those around us. Dangers must be braved, luxuries must be disregarded, and pride must be extinguished in favor of being a source of light and hope to others. Sacrifice is the spirit of Zion and the legacy of our Lord. Pioneers exemplify it. Imagine working diligently to create something beautifully and passing it on to your posterity as a special heirloom, expecting them to cherish and perhaps improve upon it. Instead, they simply neglect or even destroy it. No doubt this was a concern for the pioneers. They persevered through persecution, poverty, sickness, and death to preserve the gospel and find a place to live the ways of God peacefully, praying that their descendants would carry on their work. Nevertheless, the church continues to deal with enemies and see precious souls of infinite worth become discouraged and fall away. 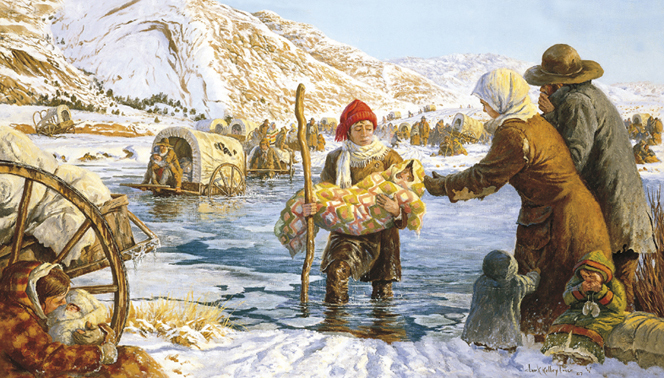 Handcart Pioneers Arrive in Salt Lake, by Clark Kelley Price. Courtesy of the LDS Media Library. The pioneers themselves were building on foundations that had preceded them. The Bible and Book of Mormon abound with the teachings of prophets and disciples who passed on their wisdom and knowledge of doctrine to anyone who would listen and take heed. They broke the cycle of apostasy, refusing to dishonor the saints of the ancient past by letting the gospel become lost. Even at the cost of their lives and comfort, they were determined to uphold the cause of the Lord. Keep building on what has already been built so far. That’s the pioneer way. Of course, the best way to build upon that which came before you is to be a missionary. Those who can serve formal missions are encouraged to do so, but everyone is expected to do something to keep the work of the Lord rolling forward with a growing momentum. With reverence toward the example of the pioneers, President Hinckley declared, “As great things were expected of them, so are they of us… We have a charge to teach and baptize in the name of the Lord Jesus Christ.” The Lord Himself commanded, “Go ye into all the world, and preach the gospel to every creature” (Mark 16:15). Their willingness to bear the scorn of the world and the harshness of the elements constituted the bearing of the pioneers’ testimonies to the children of God. If you are to be a pioneer, the question is not whether you will share your testimony with the world, but rather how. Carrying the gospel to every nation, kindred, tongue, and people is our duty and privilege. Pioneers accept that responsibility with humility and courage. Tag! You’re It. Courtesy of the LDS Media Library. Handcarts were heavy. So is the mantle of discipleship. However, when we learn from the early pioneers of this dispensation, we will find our hearts and spirits changed enough to wear that mantle well. Do you have the faith to see what cannot be seen? Do you dream of Zion above all else? Will you sacrifice everything for that dream and the betterment of your brothers and sisters around the world? Will you honor your predecessors and share the gospel with all who will listen? Can you be a pioneer? Thanks to President Gordon B. Hinckley and his inspiring direction, we may be able to pass Pioneering 101 and start on our way toward becoming pioneers in our own right. 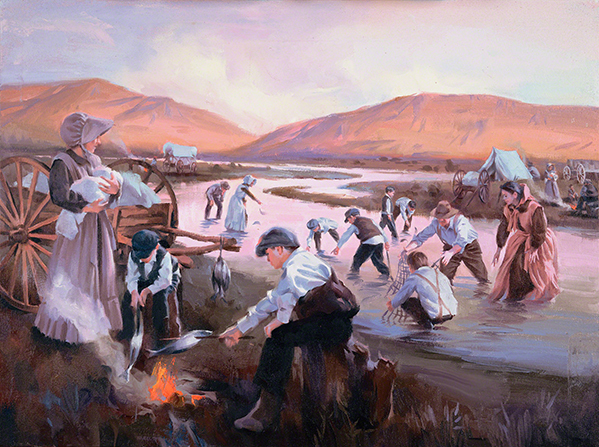 Pioneers Catching Fish, by Sam Lawlor. 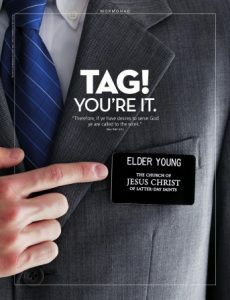 Courtesy of the LDS Media Library.